Dr. Jaffee’s research is focused on the development of novel vaccine approaches that overcome immune tolerance to cancers, and she currently holds six vaccine patents. 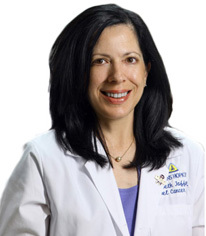 Dr. Jaffee has completed multiple studies testing an allogeneic tumor vaccine in patients with pancreatic cancer who were eligible for complete surgical resection of their tumors, but whose cancers are still expected to recur at rates as high as 80% one year following surgery. Dr. Jaffee’s first study demonstrated the safety of the vaccine and identified a dose that appears to demonstrate immune activation associated with improved disease-free survival in this patient population. These trials have also allowed Dr. Jaffee to develop both genomic and proteomic methods for identifying new pathways and biomarkers associated with the development and progression of pancreatic cancers. As an example, Dr. Jaffee recently identified the protein Annexin A2 that appears to be overexpressed in pancreatic cancers. Her group has shown that this protein changes location in the pancreatic cancer cell when compared with normal pancreatic tissue cells. This change in location gives the cancer cell the ability to spread from the pancreas to the liver and other organs. In animal models, Dr. Jaffee has shown that the inhibition of this new protein’s expression results in the prevention of pancreatic cancer spread. She is currently developing a therapy that targets this protein and plans on testing this in patients in the future.